Alabama governors have poured more than $30 million of taxpayer funds into a Mobile ship-building company that is under federal and international investigations for possible financial wrongdoing. The gravy train for Austal USA began in 2008 when Bob Riley gave $5 million in economic-development grants to the company. Riley repeated that gift in 2009, with Robert Bentley kicking in $5 million in 2012 and $10,255,470 in 2013. According to an Alabama Political Reporter (APR) post dated June 9, 2014, Bentley added another $4 million in the first quarter of that year. The lucrative nature of these taxpayer fund so-called “job creation projects,” has even lured former Gov. 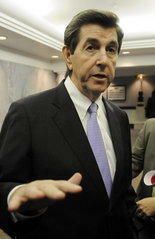 Bob Riley to become one of the State’s most visible lobbyist. Just seven months after leaving office in 2011, Riley launched Bob Riley and Associates and registered as a lobbyist, along with his daughter, Minda. Riley has been involved with the hundred million dollar Airbus deal in Mobile as a registered lobbyist for EADS North America. Riley is also a lobbyist for Austal USA, LLC, a company that, as governor, he gave $5 million in economic development grants, in 2008, and $5 million again in 2009. The payments stopped in 2010 (an election year) and did not resume in 2011,(budgeted during election year session). The payments to Austal began again under Gov. Bentley’s administration with the state giving $5 million in 2012 and $10,255,470.9 in 2013. So, far in 2014, Austal has received almost 4 million in grants and benefits. We do not have figures for the past four years, so it's likely the total figure going to Austal USA is way more than $30 million. The Austal investigation began last week at its international headquarters in Henderson, Western Australia. The next day came press reports that officials with the Department of Defense, the NCIS and the Defense Criminal Investigative Service were spotted at the Austal USA yard in Mobile. A recent study in Public Administration Review shows the negative impact of public corruption on a state’s economic future. Alabama is listed in the top ten most corrupt states in America. This investigation also found that states with the highest levels of corruption tend to spend more taxpayer funds on construction, highways, and police protection programs. This, in turn, facilitates corrupt officials to use public money for personal gain and less money on education, healthcare and welfare. A February article in USA Today cites a Gallup-Healthways survey, in which participants were asked a “large range of questions to determine the well-being” of a state’s citizen. In the poll, Alabama ranked fourth lowest, only ahead of West Virginia, Kentucky and Mississippi. Bob Riley loves spending other people's money. You can bet Kay Ivey, as a Riley puppet, will continue this crap. Maybe it will take some Aussies to bring justice to Alabama's backwoods swamp. This sounds like a deal that might have involved bid rigging. Could Mike Hubbard be talking to the feds about his old friends? He's not is jail is he? I know he is facing state time and not federal but he wouldn't be the first state inmate drafted into witsec, aka the federal witness protection program, now would he? Just asking:-) They say Florida is nice this time of the year.